Private boarding house in Kazakhstan. Photo: Sayya Asanova. All rights reserved.In Kazakhstan, people with Alzheimer’s are officially declared legally incompetent, and deprived of their civil and political rights. There are, moreover, no specialised facilities for people with dementia – they can only be placed in psychiatric care homes. There is, or course, another option – aged parents can be looked after at home, by their family. But this affects not only the finances of the family, but the mental health of its other members. Families living with someone with dementia are prone to codependency and emotional burnout. In other words, in Kazakhstan – like other countries – Alzheimer’s has a serious effect not only on the person who has the condition, but on the people around them: members of the able-bodied population, taxpayers. But this isn’t taken into account when issues around Alzheimer’s are discussed. Why does Kazakhstan, a rich country thanks to its mineral resources, pay so little attention to this condition? International figures show that in rich countries, the prevalence of Alzheimer’s will rise by 116% between 2015 and 2050, whereas the increase in states with a medium-to-low income level will be 264%. Kazakhstan falls into the second category and the forecast looks critical. Figures published by the Ministry of Health for 2017 state, however, that there are only 187 people with dementia in the country. So, given a population of 18 million, only 0.001% of them have Alzheimer’s. This would seem like an excellent situation, were it not for one big “but”. People in Kazakhstan are given no information about the condition, so they don’t seek diagnosis. In post-Soviet countries, signs of dementia are traditionally put down to simple senility. “What? Do we really have Alzheimer’s in Kazakhstan? They only have that in the west. It’s not a diagnosis you’ll find here,” says Anna. She has been forced to leave work to look after her mother, whose condition was diagnosed by a private sector psychiatrist. Anna didn’t visit a state psychiatric health centre, as she had been informed that Alzheimer’s can’t be diagnosed in Kazakhstan. After two years of looking after her mother, Anna was on the brink of divorce. Her husband was tired of his mother-in-law chasing him out of his own home, taking him for a stranger. “She even attacked him a couple of times, thinking a thief had got into the house,” Anna tells me with tears in her eyes. Anna’s mother often doesn’t recognise Anna herself, and chases her out of their apartment as well. I had a similar problem with my aunt. She would also throw me out of the door, threatening me with a knife. She also ate constantly, not knowing when she was full and complaining to the neighbours that we weren’t feeding her. She would stand on the balcony and ask passers-by for bread. But the worst part was that she had an obsession with moving house. Every evening she would turn the flat upside-down and pack things into boxes, and stop my son and me from sleeping. She would wear winter clothes in the summer and run out into the street in a summer dress in the winter. And all this had a serious effect on my emotional health. I fell into a deep depression and even had thoughts of suicide. It took a year and a half to sort the situation out, starting with getting a diagnosis of Alzheimer’s and ending with a search for private residential homes where they would take people with dementia. In September 2017, I wrote an article about my experience for Kazakhstan’s Esquire magazine, and received a huge amount of feedback from readers, including colleagues and friends. It turned out that they were all hiding family members’ dementia, out of embarrassment: “I’m afraid of what people might say”; “I’m afraid that they’ll think I have bad heredity”; I have problems with the neighbours because of my mother, so I hide her away”; “people won’t usually admit to things like that” – these were the most common reasons they gave. 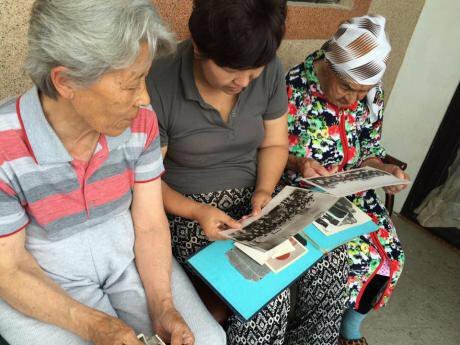 Alzheimer’s disease is stigmatised in Kazakh society, and all because of public ignorance. Here’s the first problem in a nutshell. The state makes no effort to inform people about Alzheimer’s, and so, firstly, they think that the condition doesn’t exist here and secondly, they are embarrassed about it, thinking that they are the only ones in the whole country to be affected by it. The second problem is that there is no system for providing care for people with Alzheimer’s. It’s classified as a psychiatric illness, and by law, people with psychiatric illnesses are not accepted by residential homes for the elderly: they can only be cared for in hospitals for people with chronic psychiatric conditions. But those are closed facilities and it is impossible to monitor the conditions in which their residents live. Monitoring carried out by human rights organisations suggests that they are generally badly treated. “I hired a carer, but she left after two days: she’d already had enough of my father,” Maral tells me. “Then a neighbour agreed to help, for money, but she didn’t last more than a year either. I don’t know what to do with my dad.” She can’t look after her father herself, as she’s the main breadwinner in the family. Private boarding house in Kazakhstan. Photo: Sayya Asanova. All rights reserved.The third problem is that the health system doesn’t require district health centres to carry out early diagnosis of Alzheimer’s. Diagnosis takes place in psychiatric health centres, usually when the condition is already well established. And family members consult a doctor only when the symptoms have become obvious – that was certainly the case with my aunt. 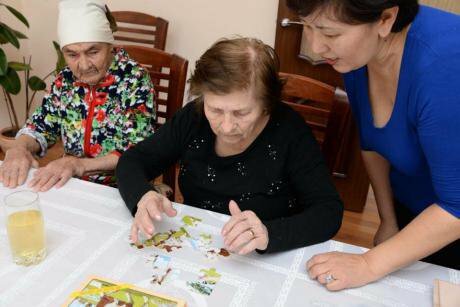 People with Alzheimer’s in Kazakhstan are eligible for social support from the state – a social worker and cash benefit. But the home help only comes for a few hours a week, and to receive the cash benefit (about €100 a month) you have to give up your pension, which is twice as much. And even then, the person with dementia has to be declared legally incompetent and registered as incapable. The result is that they are deprived of their civil and political rights and all decisions are taken for them by a guardian appointed by the courts. The state also provides a number of free medications to alleviate the symptoms of Alzheimer’s, but once again, as there are officially fewer than 200 people affected by the condition, it’s not something that receives a lot of attention. “I’m ashamed to admit that I sometimes think, ‘When will she die?’,” Sergey tells me. “It’s so hard being with her. I don’t know what’s worse – having a terminal illness but being all there, or being physically well but losing your wits. I came to the conclusion that the first option would be preferable.” Sergey cares for his elderly mother, who is in an advanced state of dementia. 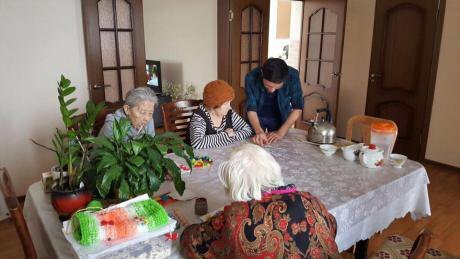 Given this situation, a group of relatives of people with dementia in Kazakhstan’s former capital Almaty have got together and rented a house for their family members and employed a carer. Others, like me, have found accommodation for their relatives in private residential homes. But there’s still a problem: you can’t find places like these everywhere. In any case, it’s ordinary citizens who are looking for solutions to the problems connected with Alzheimer’s, in whatever way they can. The main problem is that here in Kazakhstan there are no NGOs, initiative groups or experts specialising in dementia. So there is no one to promote the rights and defend the interests of people with the condition. Not to mention, which is equally important, the rights of the people caring for them. At the same time, human rights campaigner Bakhyt Tumenova stresses the fact that the initiative behind any attempt to resolve issues around Alzheimer’s and dementia has to come from the patient’s relatives themselves. Bakhyt heads Aman Saulyk (“Well-being”), an organisation that promotes the right to health. Private boarding house in Kazakhstan. Photo: Sayya Asanova. All rights reserved.“There’s a good saying: ‘If the child doesn’t cry, the mother won’t understand’. So the state ignores conditions like Alzheimer’”s, says Tumenova. “People who have this condition or another form of dementia are no longer part of the active population and can’t stand up for themselves.” And the second problem, as she sees it, is connected with the fact that the condition is incurable (unlike cancer, which can be cured), so the public aren’t being informed about it. Tumenova sees the government’s first priority as informing the population on the issues. And, banal as it sounds, the first recommendation for minimising the development of Alzheimer’s is a healthy lifestyle. “Those approaching their 60th birthday need to keep developing their cognitive functions – this can slow down the development of the condition. The government also has to provide more social support for people’s families, because caring for someone with Alzheimer’s usually means losing your own social contacts,” concludes Tumenova.